Lucas Akins ensured a winning return to Sheffield United for ex-Blades manager Nigel Clough as Burton extended their lead at the top of League One. The Brewers are four points clear as second-placed Wigan drew at Millwall. Burton boss Clough was making his first return to Bramall Lane since being sacked by the Blades last May. Akins scored the only goal four minutes into the second period, cutting in from the left wing before side-footing past home goalkeeper George Long. "It was a brilliant win - the performance as well. I thought we dominated the game throughout. "We created enough chances to score more than one goal but also restricted them to I think one header at the end. "It was a complete away performance in lots of ways." Match ends, Sheffield United 0, Burton Albion 1. Second Half ends, Sheffield United 0, Burton Albion 1. Tom Flanagan (Burton Albion) wins a free kick in the attacking half. Substitution, Burton Albion. Tom Flanagan replaces Callum Butcher. Corner, Sheffield United. Conceded by Lucas Akins. Substitution, Burton Albion. Callum Reilly replaces Mark Duffy. Delay in match Mark Duffy (Burton Albion) because of an injury. Corner, Burton Albion. Conceded by Alex Baptiste. Mason Bennett (Burton Albion) wins a free kick in the defensive half. Substitution, Burton Albion. Mason Bennett replaces Stuart Beavon. Substitution, Sheffield United. Alex Baptiste replaces Jay McEveley. Foul by Dominic Calvert-Lewin (Sheffield United). Attempt saved. Lucas Akins (Burton Albion) right footed shot from the left side of the box is saved in the bottom left corner. Substitution, Sheffield United. Benjamin Whiteman replaces Paul Coutts. Substitution, Sheffield United. Dominic Calvert-Lewin replaces Florent Cuvelier. Attempt saved. Lucas Akins (Burton Albion) right footed shot from the centre of the box is saved in the centre of the goal. Mark Duffy (Burton Albion) wins a free kick on the left wing. Foul by Florent Cuvelier (Sheffield United). Goal! Sheffield United 0, Burton Albion 1. 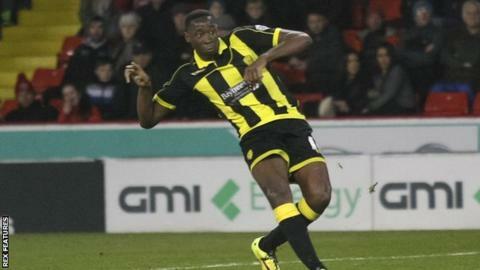 Lucas Akins (Burton Albion) right footed shot from the left side of the box to the bottom right corner. Assisted by Damien McCrory. Second Half begins Sheffield United 0, Burton Albion 0. First Half ends, Sheffield United 0, Burton Albion 0. Damien McCrory (Burton Albion) wins a free kick on the right wing.